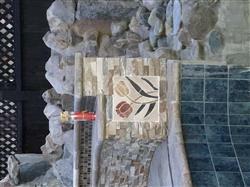 Tangled Flowers Stone Mosaic That Is Fully Handmade From Natural Stones And Hand Cut Tiles. Customization available for size or border to give the perfect fit you need. Do you like to see how Mosaic Wall Art - Tangle Tulle looks on your wall? Loved this piece of art looks amazing! Prompt shipping - very happy with 2 out of the 3 pieces I purchased.